Two of Europe’s most popular countries are now connected with Thello services, a high quality and fast train which travels up to 180mph as it traverses the countryside between Italy and France. Thello night service brings you to Italy and France! Thello trains are now offering a special discounted fare to passengers with an InterRail or Eurail pass that is valid in either France or Italy. This special fares gives passengers 25% off the adult rate and is available up until the train's departure. It is available in both sleepers and couchettes. To book your special Thello pass holder fare, simply choose your departure and arrival stations and then click 'I have a rail pass'. 2nd class passes: can book couchettes only. “Special” fare seats are largely available on Thello! If availability is over for the day you’ve been enquiring, please try the next/previous day. Availability may be restricted on high season dates such as Fridays, Sundays and Bank Holidays in Italy and France. * Upon boarding your Thello train the conductor will ask to see both your InterRail or Eurail pass as well as your electronic ticket for your special pass holder fare. While travelling on Thello services, you can sleep soundly on the smooth tracks between France and Italy. Thello night services offer both couchette and sleeper accommodation for a good night’s sleep. 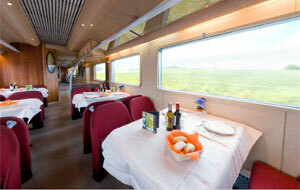 Trains run between the main cities of Milan and Venice in Italy and Paris and Dijon in France. We invite you to put your feet up with a soft pillow, warm blanket and a good book after a long day of sightseeing, or have a dinner in the restaurant car before retiring to your cabin for the night. Sit down restaurant services are available for breakfast and dinner and bar services are available for snacks and drinks. 6-berth and 4-berth couchette cabins – Service including berths where passengers can lie down and relax during the night. Cabins are air conditioned and passengers are provided with a bottle of water. Attendants are also available to wake passengers up in the morning. 3-berth, 2-berth & single sleeper cabins. Accommodations are available for either 1, 2, or 3 people. The cabin has a washbasin with hot and cold water, a real bed, and a complimentary toiletry kit with a bottle of water is given to each passenger. On arrival, you will receive a welcome drink, and in the morning, the attendant will serve a continental breakfast (hot drink, juice, croissant, butter and jam) together with the newspaper of the day in the dining car (both included in the cost of your ticket). There is a no smoking policy onboard this train. Thello night trains run through Switzerland: customers must show the ID card valid with the necessary Visa Passport. Thello train tickets are personal and are valid only with ID card and must be booked in the same name as the reservation. Pets under 11 pounds travel for free with owner. Pets from 11 - 110 pounds travel for a surcharge of $65. Restrictions and rules apply.